I also remembered an old music video for The Get Up Kids song 'Overdue', which I originally saw as a bonus video to their UK single release. It again incorporates simpler techniques to showing movement but I also forgot to mention that all these videos make use of camera angles, pans and zooms to show progression and in particular on this video, as cuts and fades to the next scene as the camera pans across. I have already mentioned these previously but I didn't go into a lot of detail and I don't want them to be lost amongst my old posts (once I get further into this blogging malarky). 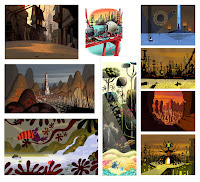 I love 50's style animation and illustration which explains why I love cartoons such as Samurai Jack and the Star Wars:Clone Wars series, which both take influence from this specific era in exaggerating features and shapes that make up their characters and backgrounds. Genndy Tartakovsky has written, storyboarded, animated, directed and produced both of these as well as others such as Dexter's Lab and The Powerpuff Girls, but its Dan Krall and Scott Wills who's artwork features in 'Jack and 'Clone Wars which gives the characters many beautiful backgrounds to inhabit. I have recently thought character design only stemmed to characters/figures but each of the backgrounds painted by both these artists has more character and mood than all of the work I've created. Immediately you feel a sense of scale and space in each piece making you want to dive into them yourself and experience the environments whether they're futuristic cities or heavily wooded forrests, if i can achieve this once in my upcoming animation i'll be happy... but I wonder where to draw the line between stealing techniques and copying styles.